Typically, the beginning stages of a relationship is filled with happiness, excitement and romance. As the relationship progresses, it is not uncommon to experience some nervousness and concerns about the future of the relationship and question where the relationship is headed. On the one hand, discussing your future together can be exciting, but on the other hand such conversations can seem intimidating. When it comes to relationships, its very easy for us to forget that fostering a healthy relationship needs consistent work and effort from both partners. The time you spend working on your relationship right now can influence the quality of your relationship years into the future. 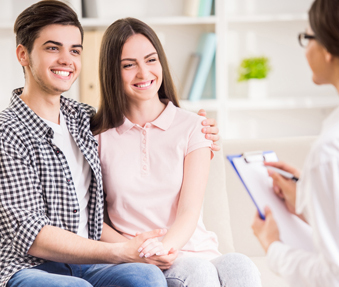 Premarital therapy and Marriage preparation services can be helpful at any stage of your relationship: cohabiting, considering marriage, engaged, newlyweds or long term partners. Some couples participate in these sessions pre-emptively to explore and strengthen their relationship further, whereas others are facing difficulties and are looking for tools & strategies to improve their relationship. Do we want to get married? How do we handle finances? Marriage preparation and premarital therapy can be helpful in defining and setting realistic expectations, building communication skills and effective conflict management in the relationship. Premarital therapy can play a key role in facilitating a smooth transition into the next phase of your relationship. Often couples, even those that have a strong relationship, sometimes express that there are a few conversations that they are hesitant to have with their partners. Participating in premarital therapy sessions provides an opportunity for you to talk openly, understand each other and grow as a couple. Couples often express that premarital therapy has been helpful for them in exploring whether to take their relationship to the next step or if one or both partners are experiencing “cold feet” or struggling with “commitment issues”. In an safe, open and unbiased environment couples can learn how to discuss the future of the relationship, examine concerns about the relationship, manage their anxieties, and explore the next stage in their relationship. As you approach your wedding, it’s not uncommon for you to have some fears and concerns. Couples research suggests that half of all marriages end in the first 7 years of the marriage. Although, the two of you as a couple are committed to one another and love each other greatly, hearing such statistics can no doubt weigh on your mind and make it harder to feel confident about the future. All couples face differences in opinions and disagreements. In a marriage, two individuals are bringing their own set of values, beliefs, and opinions based on their family history and experiences in life, which may not always be similar to their partner. That is why many couples benefit from marriage preparation services so that the time up until the wedding or during your marriage is easier to manage and is joyful. As registered psychologists, Dr. Ahmed & associates have worked with couples at different stages in their relationship. The services provided will focus on what you both need to have a successful relationship as a couple, strengthen your ability to handle issues that may come up in the future, provide you with the tools and strategies so that you are working in collaboration with our partner, are open to accepting and making changes in your relationship and are ready for your life together as a couple. If you’re interested in premarital therapy or marriage preparation services, contact Dr. Ahmed & associates for a consultation.